One stop shopping for all your hospitality needs. Toronto is a multi-cultural hub with first-class entertainment, shopping and fine dining. 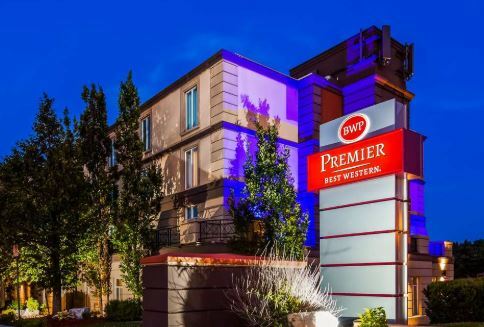 An oasis within the busy city, the Best Western Premier Toronto Airport Carlingview Hotel has comfortable, yet sophisticated accommodations that are sure to meet all your travel needs. This training facility is located at the rear of a former school in Niagara Falls, just off Highway 420 and Drummond Rd. There is ample free parking and it is near to restaurants and foods options during breaks. The Lions Club of Stoney Creek is located not far from the QEW, at the Fruitland Rd exit, south towards Highway 8. Four Points Mississauga Meadowvale is located in the Meadowvale Business Park, only minutes from the Mississauga Convention Centre. The city is less than 30 minutes east from our Mississauga hotel. We’re also close to the area’s major highways, a short drive from Toronto Pearson International Airport, and one block from the GO train station. The Streetsville Room is located on the main floor. Holiday Inn Hotel & Suites St. Catharines Conference Centre is our regular location for hosting all our Niagara area courses. This location is just 5 minutes from the QEW and features ample free parking on-site, spacious meeting rooms suitable for our training courses, and is close to many restaurants. Located just off the “Linc” at Upper James, on the mountain overlooking Hamilton, the Courtyard Marriott has been newly renovated and features lots of free parking, clean and spacious meeting rooms for our training courses, and and close to a selection of restaurants and coffee shops.